If your patio needs a little sprucing up to make it more usable and beautiful, here are a few quick updates that will make you feel dramatically more at home on your patio. You don't have to be a landscape designer to add a little greenery to your garden. 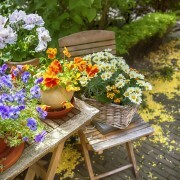 You can buy potted flowers and plants at a nursery or hardware store and arrange them around your patio. They will make the area look fresher and brighter. Plus, they're affordable. 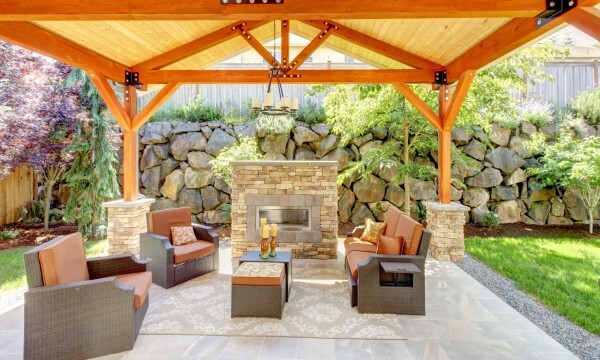 If your patio doesn't offer much privacy, it might not feel cozy. You can come up with some creative ways to block your space from view to feel less self conscious and more peaceful. Using a faux-bamboo screen is one great idea that also offers a little shade. If you have a roof or awning, you can hang potted plants with vines that hang down to create more privacy. 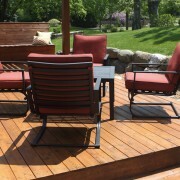 Patio furniture can take a beating over the years. If yours looks a little lackluster, why not spruce them up with a fresh coat of paint? It's even easier to use spray paint to get a furniture set looking like new again. Take it out to an area of the yard where nothing else will get damaged and wipe them down with a wet rag. Then give them a coat or two of paint, either touching up the old colour or in a fresh new hue. If your floors aren't in tip-top shape, consider buying an outdoor area rug to help make your patio look more polished. 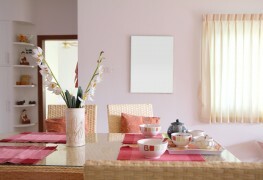 You can choose a colourful one to match your furniture and cushions or choose a subtle accent colour. These can typically be found at home goods or hardware stores or even online. Sort through a variety of options from solid rugs to those with intricate designs. If your furniture cushions are a little tattered and worn, you don't have to buy brand new ones. Just select a fabric that you like and reupholster them yourself. You can usually do so with a few simple tools. Just use a staple remover to remove the existing fabric, make sure there is enough new fabric to wrap completely around the cushion, and use a staple gun to attach the new fabric to the underseat. 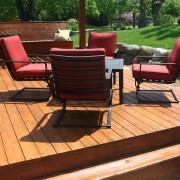 It will give your outdoor seating a whole new life. Recover or buy new throw pillows to further revive your old furniture.